It is very common, during pregnancy, to experience an increase in the thickness of hair growth. The lifecycle of the human hair follows 3 stages; the active growth stage (anagen), the transitional stage, where the follicle prepares to shed the hair (catagen) and finally, the resting stage (telogen) when the hair is shed and the follicle is dormant for a few months before the cycle repeats itself. During pregnancy the levels of the hormone estrogen are raised, which causes the growth and transitional phases of the hair growth cycle to be prolonged so that less hair is shed at this time. This may be great for the hair on your head, but not so welcome when it comes to underarms, legs, bikini area etc. The good news is that, after you give birth and finish breastfeeding, your hair levels will return to normal, but in the meantime what are the best and safest methods for keeping yourself hairfree? This is the obvious first choice, as it is easy to do at home, and involves neither painful pulling from the root or the use of chemicals that may be absorbed through the skin. Please don't be fooled by the common myth that shaving causes hair to grow back thicker - it simply is not true! The reason some people think that the hair appears thicker and darker is probably due to the fact that the hair is wider nearer to the skin and tapers off as it becomes longer. When it is cut at skin level and then begins to grow, the top of the hair is wider - as shown in the illustration above, which may lead to the illusion. So, if your normal method of hair removal is shaving then all is good, just carry on as usual and if not, at least don't be put off by regrowth issues. Just do be careful as you become bigger, and sit down safely if you are shaving legs or bikini area as balancing will become more tricky. You may even need to employ help in the latter stages, as being able to see and reach certain areas becomes more difficult. If you usually use a razor, then you might like to consider investing in an electric shaver to make life a bit easier and safer. Also, use a gentle shaving cream designed for those with sensitive skin. 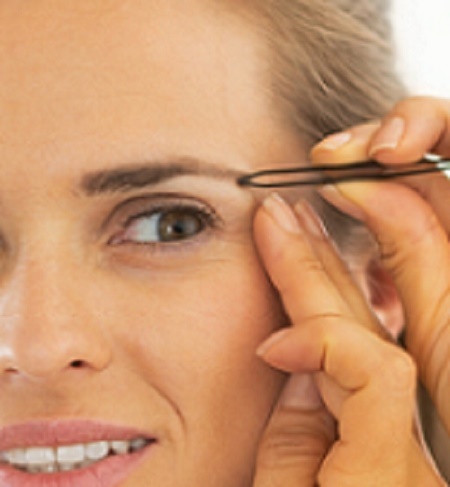 There should be no problem whatsoever with tweezing individual hairs on small areas such as eyebrows during pregnancy, equally threading should be fine. However, the raised hormone levels can lead to all sorts of skin issues, including increased sensitivity, so that you may find that using an epilator is much more painful than usual. Also, the skin is more susceptible to break outs so that, even if you normally have no problems with using an epilator, you may experience irritation during pregnancy. It may be that you will just have to bite the bullet and shave your unwanted hair for the duration, or perhaps epilate less frequently, covering small areas at each session. Although there is no medical reason not to wax as usual, the same problems exist with regard to sensitivity as with using an epilator. It is a good idea to carry out a small patch test prior to waxing to see what effect, if any, it has on your skin and how it feels. If you are using a salon, make sure that you let them know you are pregnant. This is where it becomes a little more tricky. Yes, it is most likely that depilatory creams are perfectly safe to use during pregnancy, however I have not been able to find any evidence to prove or disprove their safety at this time. Depilatory creams do use harsh chemicals, that may be absorbed via the skin. However, they are left on for a very short period of time so that any absorption would be very slight and insufficient to cause any harm. However, as previously mentioned, your skin may well be more sensitive than usual and you may experience side effects that you have not had previously. Therefore, always ensure that you carry out a patch test prior to use, and opt for a sensitive formula. There is no clinical evidence to suggest that laser hair removal during pregnancy is either safe or not safe in terms of the actual pregnancy itself. However, it is generally not recommended because skin tone can be affected by pregnancy, as more melanin is produced (the pigment which gives your hair and skin its colour). This means that there is a risk of heightened sensitivity to the laser treatment and possible permanent damage to the pigmentation in the skin. It is unlikely that any salon will want to treat you but will probably defer any pre-booked treatments until after the birth. Obviously, home laser/IPL devices are less powerful than those used in a salon, however I would certainly urge caution and personally would not consider any possible risk to be worthwhile. I recognise, of course, that some individuals have more issues with unwanted hair than others and so, if you really want to go ahead whilst pregnant, I would urge caution and that you seek medical advice first. A similar situation exists with electrolysis as with laser hair removal in that it is not possible to state categorically that it is either safe or not safe during pregnancy. For this reason, if for no other, I would not recommend taking the chance. Your electrologist, if willing to go ahead, will more than likely ask for a letter of authorisation from your medical practitioner prior to treatment during pregnancy. In fact, if they don't ask for one, I would be wondering why! Galvanic electrolysis uses electrical current administered via a probe into the base of the hair follicle, and is not recommended in any case, during pregnancy. Thermolysis uses heat rather than electricity, and may be considered an option.